Good evening. 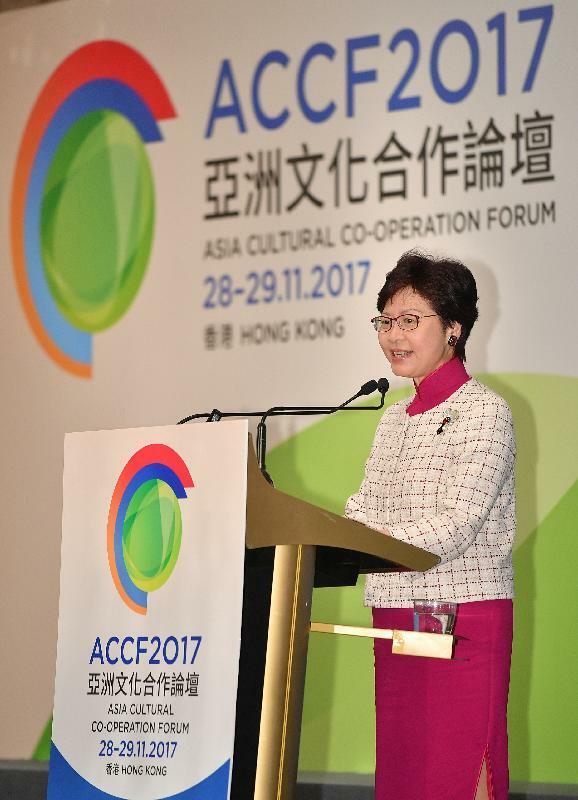 I'm honoured to welcome you to the Asia Cultural Co-operation Forum. This singular gathering brings together cultural ministers and senior officials from all over the region, here in Hong Kong to exchange ideas and experience that support the critical development of arts and culture throughout Asia. I am extremely grateful to Minister Luo Shugang and Asia's cultural ministers for your continuing support of this Forum. My thanks, as well, to our many distinguished consulates-general and key figures from Hong Kong’s cultural sector. Your presence tonight not only reflects your passion for arts and culture but also an appreciation of the role that arts and culture could play in inter-connected development in Asia, and beyond. Indeed, this year, alongside participants from Hong Kong and the Mainland, we welcome high-profile officials from nine Asian countries. This is a remarkable line-up that speaks well of our shared and unshakable commitment to cultural development in Asia. I first attended this Forum in 2006 in my then capacity as the Permanent Secretary for Home Affairs. I took part in this Forum as the Chief Secretary for Administration. I am glad to be back as the Chief Executive, particularly given that this year is the 10th anniversary of the Forum – and the 20th anniversary of the establishment of the Hong Kong Special Administrative Region. Hong Kong is a multi-faceted city and the Chief Executive of the HKSAR, naturally, has many challenges. But I can assure you that having been responsible for Hong Kong's cultural policy in Home Affairs Bureau and the chairperson of the West Kowloon Cultural District Authority Board, arts and culture is very close to my heart, and will occupy an important place in my policy portfolio. Why should culture be given increasing prominence by government leaders? In his work report to the 19th Congress last month, President Xi Jinping said that culture is a country and nation's soul. Our country will thrive only if our culture thrives, and our nation will be strong only if our culture is strong. Without full confidence in our culture, without a rich and prosperous culture, the Chinese nation will not be able to rejuvenate itself. That's why President Xi, in his work report, acknowledges that to meet the people's new aspirations for a better life, we must provide them with rich intellectual nourishment, and hence the promotion of the development of cultural programmes and industries. For the next few moments, just allow me to share Hong Kong's vision for cultural development. The theme of this year's Asia Cultural Co-operation Forum, namely "Cultural Sustainability in a Dynamic World: Connecting Diversity", reflects the traditional Chinese virtue of harmony, in which cultures co-exist peacefully, all the while maintaining their singular sensibilities. Not surprisingly, it echoes our own vision: to develop Hong Kong into an international cultural capital with a distinct identity – one rooted in Chinese tradition uniquely enriched by a blessed bounty of other cultures. In short, Hong Kong is a proud confluence of East and West. And this historically grounded gift – our cultural diversity – has created an enabling environment, allowing a great continuum of cultural businesses and ventures to flourish. Thanks to our strategic location at the heart of Asia and our long-established role as the gateway to the Mainland, Hong Kong offers rewarding access to opportunities throughout the region. In recent years, international art fairs and renowned galleries have chosen Hong Kong as their Asian base, injecting creative and commercial vitality into our local art scene. In Hong Kong today, auction houses fetch record-breaking prices for art and antiques, making Hong Kong amongst the largest art markets in the world. At the same time, they have opened the world to the beauty and brilliance of Asia’s many cultures. This has set in motion buoyant art markets that have helped in the rise of Asian art and artists to global prominence. Hong Kong also embodies a heritage rich in tradition. And this diversity has provided renewed inspiration to the cultural and creative industries. Just as the cheongsam, or qípáo, has claimed the world's fashion runways, so, too, will Chinese opera find its rightful place, thanks to the spotlight our fast-emerging West Kowloon Cultural District will give it. West Kowloon's Xiqu Centre, expressly designed to showcase Chinese opera, scheduled to open next year, is proudly the District’s first major performing arts venue. Cantonese opera, which is on the local, national and UNESCO lists of intangible cultural heritage, is gaining popularity amongst our youth. Indeed, two of our gifted child artists performed Cantonese opera during President Xi Jinping's visit to Hong Kong in July, right on the site where the West Kowloon Cultural District is going to be. The much talked about Belt and Road Initiative will re-invent tradition on a much grander scale. The ancient Silk Road was opened up by the imperial envoy Zhang Qian back in the Han Dynasty. In the Ming Dynasty, Admiral Zheng He shaped the Maritime Silk Road. Today, the Belt and Road Initiative is connecting people, places and ideas. It will engender a profusion of cultural and people-to-people bonds. This reality gave me much pleasure this afternoon in officiating at the opening of the exhibition "Miles upon Miles: World Heritage along the Silk Road." Ladies and gentlemen, a globalised, urbanised, tech-savvy world is not necessarily at odds with tradition. Rather, it can present us with opportunities to rediscover and revitalise our time-bound cultures. Together, we can realise a renaissance of traditional cultures, creating new values in the meeting of yesterday and today. This is what we envision as cultural sustainability in a dynamic world. I wish you all a very enjoyable evening, a rewarding stay in Hong Kong and a wealth of cultural experience in the New Year.